With every type of surgical procedure, patients are often most anxious about the potential for pain during and after the procedure. One of the primary factors of LASIK is that it is performed with a minimal level of pain, regardless of the eye condition that is being repaired. When you have your initial consultation with your LASIK surgeon you will be given a detailed account of what you may expect throughout the procedure, so that you are not presented with any surprises on the day of your surgery. Prior to the surgery, you will be offered a very mild oral sedative. This sedative will not make you fall asleep. Rather it will allow you to feel much more relaxed and at ease about the procedure that you are about to experience. A large number of LASIK patients are filled with anxiety about the procedure, and the mild oral sedative can simply help them to relax so that they can get through the procedure without much discomfort and anxiety. Once the mild sedative has started to take effect, the LASIK patient will then be instructed to relax in the surgical chair so that the procedure can begin. The LASIK surgeon will use anesthetizing eye drops that are placed directly into the open eye. These drops are very much like the numbing gels that a dentist will use on directly on gums prior to a dental procedure. The anesthetizing eye drops will start to work almost immediately, which will ensure that the procedure is able to start rather swiftly once the drops have been administered. The first part of the procedure will involve the placement of an eyelid speculum placed directly onto the eye of the patient. This clamp will help to keep the eye immobilized during the procedure, which will help to ensure that the laser being used during the procedure is able to readily access the cornea. The placement of the speculum will not at all be painful, especially since the anesthetizing eye drops will be completely effective at this point. Some patients however do report that the placement of the speculum causes a little bit of discomfort. With the speculum in place, and the eye now immobilized with a corneal ring to prevent against any eye movement. Patients feel pressure as the corneal ring is applied, but it is not painful. The LASIK surgeon will carefully create what is called the corneal flap. This is done by lifting up a microscopic layer of tissue from in front of the cornea so that the surgeon can have better direct access to the cornea itself. This flap of tissue is hinged so that it is not completely removed from the eye itself, and is carefully lifted up and off to the side for the duration of the procedure. This may sound somewhat disconcerting to the patient but it is important to note that the eye will be completely numb from the anesthetizing drops, and the mild sedative that was taken will also ensure that the patient is completely relaxed and at ease during the procedure. At the most patients have reported feeling a bit of pressure and a sense of being disorientated as their vision changes. The lasers that work with excellence in precision will not cause any pain or discomfort to the patient. The disorientation may be present, but that will quickly pass due to the overall swiftness of the procedure itself. Once the lasers have completed the procedure, the surgeon will gently replace the corneal flap across the surface of the eye. Care will be taken to ensure that it is a seamless fit and that there are no protruding sections or air bubbles between the flap and the surface of the eye. The LASIK patient will not feel pain, but may again experience a little bit of blurring of their vision. Many patients report that they don’t feel any pain, but they do feel a little bit of discomfort as the corneal suction ring is placed onto the eye and then again as it is removed from the eye. The vast majority of patients also report that they see an almost instantaneous improvement in their vision once they are able to sit up and take in their surroundings. Vision will continue to improve as the cornea repairs itself over the course of the next several months. Some patients report burning once the anesthetic wears off, but this burning sensation only lasts temporarily. 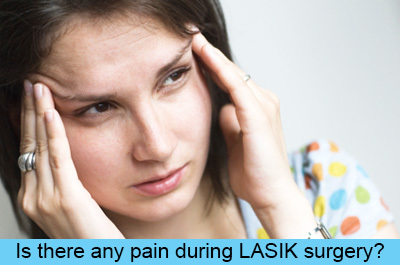 On the day of the surgical procedure many LASIK patients report that their eyes feel somewhat itchy and gritty. It is important not to rub at eyes that have recently undergone LASIK surgery. Very few patients feel any pain or discomfort after the surgical procedure, but it is advisable to wear dark sunglasses in order to shield the healing cornea from direct sunlight and other sources of bright light. Any discomfort that is felt can typically be attributed to too much direct sunlight and is often easily remedied with an over the counter pain reliever. "The placement of the speculum will not at all be painful, especially since the anesthetizing eye drops will be completely effective at this point. Some patients however do report that the placement of the speculum causes a little bit of discomfort." This is true for most people, but not everyone. Lasik surgeons know that people with small orbits cannot easily accommodate the instrument and may experience significant pain while the speculum is forced into the socket. I have small orbits and my surgeon shared that with me before he tried to place the instrument. Calling the pain experienced a "little bit of discomfort" is simply not accurate. It hurt a lot for about a minute. This is what it felt like: Imagine someone is trying to force a piece of metal past the protruding bones above and below your eye, but it's a little too big, so they have to shove and slightly twist it in. That's what they have to do. Does that sound like a "little bit of discomfort?" Nope. It was a lot of discomfort. It was worth it, but an "optometrist reviewed" article should have accurate information. I too have small orbits and the pain of the putting the ring on my cornea was excruciating. I stayed still and calm because I didn't want the laser to damage my eyes if I moved. My doctor never told me that this could be an issue. He insisted that the procedure was painless and all I would feel if slight pressure. I was traumatized after the procedure. My doctor apologized for my "discomfort." I should have taken pain killers or valium had I known what I was in for.